I received the following email earlier today with the subject heading "Haloscan is being discontinued." Haloscan is, for the non-techies in the audience, the application that this site has used for years. It powers the comments feature and the trackbacks at the bottom of each post. Our records show that you are (or have been) using the Haloscan commenting service on your Blog or website. 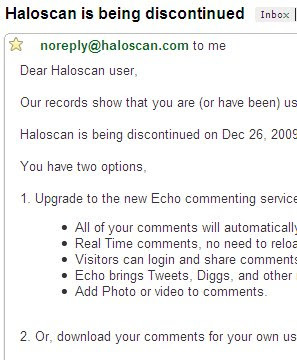 Haloscan is being discontinued on Dec 26, 2009. 1. Upgrade to the new Echo commenting service; $9.95/year. * All of your comments will automatically be moved for you. * Real Time comments, no need to reload the page to see new comments. * Visitors can login and share comments with FaceBook, Twitter, Yahoo! and more. * Echo brings Tweets, Diggs, and other mentions of your site directly to your pages. * Add Photo or video to comments. 2. Or, download your comments for your own use for Free. Please note that you must chose one of these options before the cut off date or your comment service and data will be inaccessible. Please log into your Haloscan administration dashboard at http://haloscan.com/members/ to learn more about the transition options. I'm not real good at arithmetic, but this appears to be a threat. Tony Soprano says that if we don't pay up within a few days that my 10,000-or-so comments by users will be deleted. Some might call that type of message blackmail. But I call it stupidity. Consider the ill-will that this type of behavior engenders. Among bloggers! You hear me? 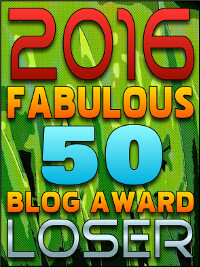 These are bloggers, for heaven's sake! It's not like they're gonna shut up about this garbage! Anyhow, perhaps you've noticed some formatting problems with our esteemed journal of late. Our formatting editor -- yes, it's Biff Spackle -- has tried to reformat the site to remove Haloscan altogether. Let us know in the comments, or via email, if you've been seeing problems. And we apologize in advance for this crap, but -- frankly -- go call Haloscan and tell them they're wankers. I see a PR nightmare on the horizon. How much ya wanna bet that they take subscriptions and go belly up a little later anyway? 2. Download your comments for your own use for Free. This is a friendly note to let you know the HaloScan servers are 6 years old the service needs to be shut down. No free service can continue forever. This is a friendly note to let you know the HaloScan servers are 6 years old the service needs to be shut down. Khris, while I appreciate the note... you guys ever heard of VMware? You can do a PtoV conversion in like nine seconds to replatform the software. And if you're stuck with old OSes like NT and 2000, you can use SolidCore to secure the systems so you can keep 'em running indefinitely without getting pwned. No free service can continue forever. Really? Heard of Google? How about Yahoo? Free services that appear to be profitable? Haloscan was serving up ads on every comment page, for heaven's sakes. Granted, they did an incredibly poor job of it -- and the tool itself basically suuuuuuucked -- but don't blame the users for your failed business model. Well, thanks for having the cojones to show up and comment, but feel free to relay the remarks to the powers-that-be.